Enjoying a Norwegian dinner, a photo by Southworth Sailor on Flickr. 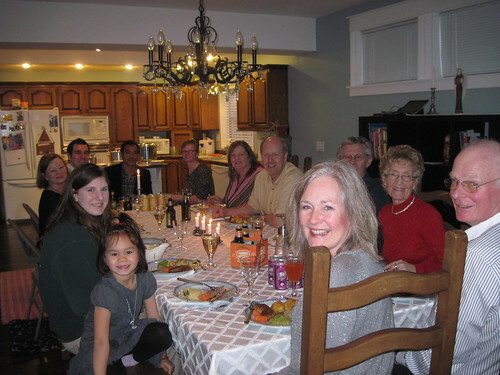 Yesterday we enjoyed Norwegian holiday dinning with Esther's cousins from Tacoma and Norway. Anna and Touren put on a scandinavian feast with kjøttkaker (meat cakes) as the main dish. Uncle George and Aunt Kirstin were also there along with Mike and Marti's family. It was good to catch up with the Norwegian family news. Esther has two uncles and an aunt still living in Norway, all in their nineties. (and with sharp minds :)) Anna gave me some tips and encouragement for my upcoming marathon as she ran the Seattle Rock-n-Roll this summer.